Run out of time? 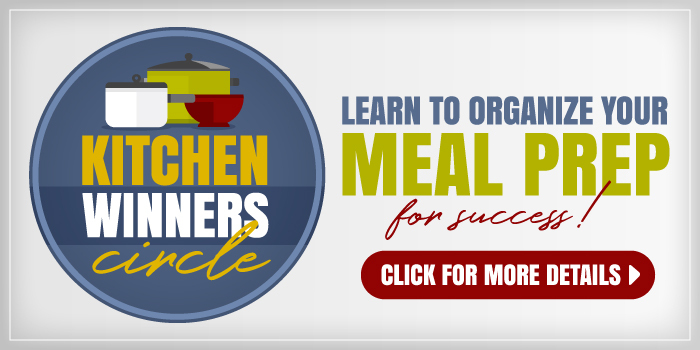 Need a last-minute appetizer to serve guests or take to a pot luck? 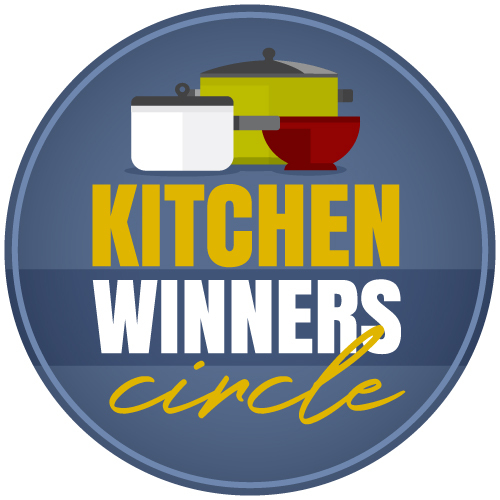 Check out these three winners. As I mentioned on Monday, appetizers can easily make a meal. They are also an easy thing for you to bring to a holiday potluck without a lot of hassle and expense. If you know that your main meal will be awhile after your guests arrive, having a platter of snacks is a great way to welcome folks. In France, the aperitif course (a drink and a few bites of something) is the perfect way to start off the evening. 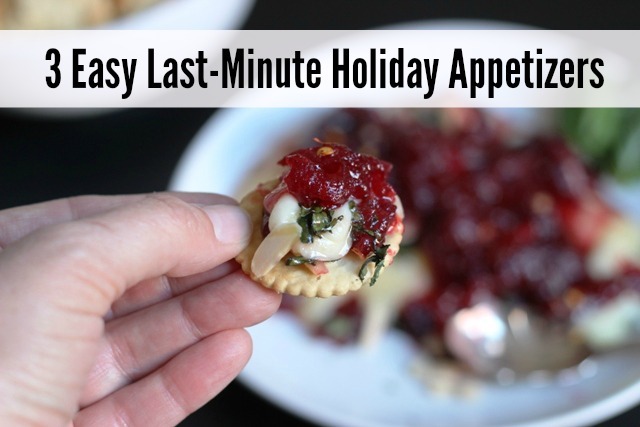 I’ve got three great appetizer ideas that you can prep in about ten minutes, if that. None of the ingredients are all that crazy and these are always a hit. 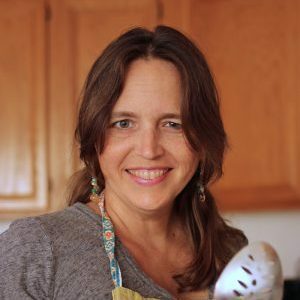 The best thing is that if you are really pressed for time, you can grab the ingredients at the store and assemble in just a few minutes at your destination. 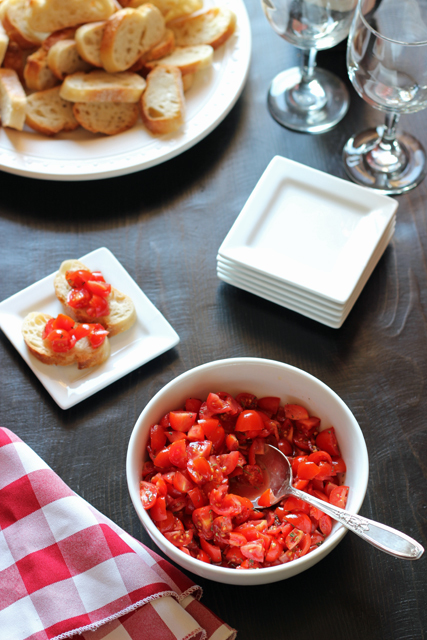 This Tomato Bruschetta with Herbes de Provence is something we enjoyed many times during our stay in France. Grab a baguette, a box of grape tomatoes, some herbes de provence, oil, vinegar, salt, and pepper. This dish comes together easily but looks beautiful and festive. 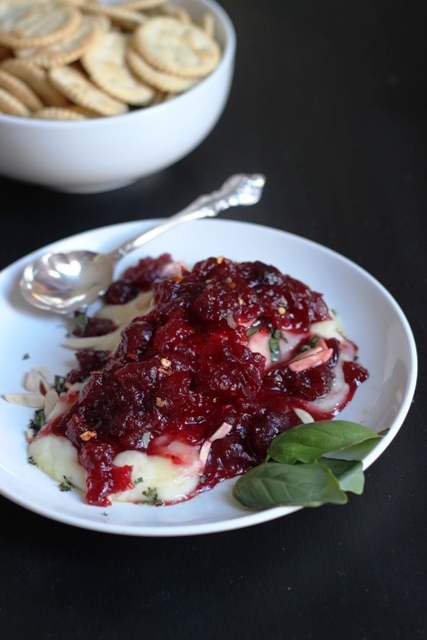 Cranberry-Basil Baked Brie is another festive and colorful dish to serve. Add brie, cranberry sauce, basil, crushed red pepper, and slivered almonds to your grocery list. This hot app comes together in minutes. Serve it with crackers or baguette. I’ve got a baguette theme going here. 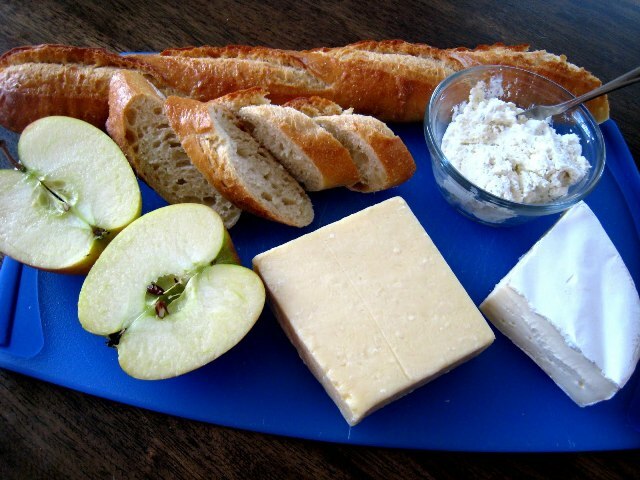 If push comes to shove, grab three kinds of cheese, some apples, and a baguette or two. You can even buy baguette pre-sliced or ask the baker to slice it for you. A Cheese Platter always works in a pinch. Got a favorite appetizer that’s quick and easy? How Can I Save Money This Week? I’m having our annual family Christmas party on the 27th of December. Every year, it’s always the first Saturday after Christmas and this year it’s my turn to host it. I have a list of 16 hot and cold appetizers that I’m making. Some of them are quick and some are a little more time consuming. One that is quick and easy are my mini reubens. These please all of the reuben lovers. Lay slices of cocktail rye on a cookie sheet. Spread about a 1/2 tsp. of Thousand Island dressing on each one. Fold a small sliced of corned beef the size of the bread and place on top of dressing. Spread a small amount of sauerkraut on top of corned beef. Cut a piece of swiss cheese to fit the bread and place on top. Bake at 400 for about 10 minutes or till cheese is melted. Sounds yummy! Thanks for the idea! A tub of sour cream and a jar of a homemade spice blend to make a quick dip. Tubs of flavored cream cheese for dipping or spreading. A couple of boxes of assorted crackers. You are always so organized. Nicely done. On a pretty plate, lay thinly sliced apples (pink lady or honey crisp are best), then crumble bleu cheese (or goat cheese) over the apples, drizzle honey over that, and then sprinkle a little fresh mint. Voila! Always a hit and so very simple. Sounds great! I’ve never seen this before, but it sounds great. Thanks for the tip, Beth!